Last week I did a quick report on what I saw at a nearby Toys R US. This week I swung by the one to the south of me (South Austin, Texas) and picked up a few of the new sets and tried to get decent pictures of the others. I forgot to get a few prices on the some of the sets, and I may have missed a few Bionicle sets, but here’s a run down of 2010 LEGO sets I saw tonight that I didn’t see last week, along with prices. Keep in mind that this is the day after “Black Friday” – there could have been plenty more sets that were sold through. I did see all of the previous sets mentioned in the link above. I do believe some of those prices will drop or change when other retailers start carrying them. 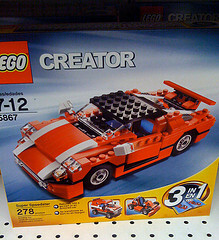 I’ve uploaded photos of all of the above to the 2010 LEGO sets at Toys R Us flickr page I created last week. In addition to my reviews of the above, Jason will be posting a review of Power Miners 8191 Magma Mech ($19.99) on Sunday (Nov 29), and I saw this one tonight as well. I’ll also be working on an update to the Creator 5866 Review of the Rotor Rescue, building out the other two models of the 3-in-1 kit.